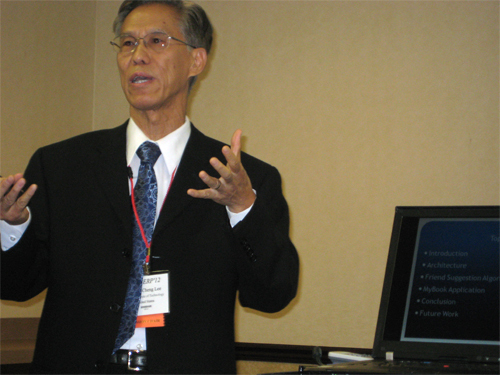 Olivet Institute of Technology Dean Dr. Ching Cheng Lee represented Olivet University at this year's Software Engineering Research and Practice, SERP2012, International Conference in Las Vegas, Nevada. Dr. Lee presented his paper "An Object-oriented Social Networking to Link People with Similar Interests and Activities" along with chairing a conference session "Web Applications & Case Studies + Test Automation." In his paper, Dr. Lee proposed a new algorithm to suggest friends with similar interests and activities for social networking. The method involved statistical sampling with RSS weighted prediction. The conference session had presenters from many countries including US, Japan, Saudi Arabia, Korea, and others surveying various aspects of applications including Semantic Web methodologies, Every day Cloud computing, Extensible Web-based Learning architecture, and GUI software testing automation systems. "I feel privileged to represent Olivet and correspond with many international researchers," said Dr. Lee. "The SERP Conference is great in terms of finding new approaches to engineering and exchanging ideas with other bright minds. I was able to contribute and at the same learn of new trends to bring back into Olivet’s academic programs." "We were able to receive many positive responses on the different approach to the new approach to online social networking. I feel that this new application can bring about active results," added Lee.